A note from Robert White: “Writing an essay for this Men’s Anthology was a delight! Sometimes writing is sheer agony so when it flows easily, I know I should notice and be grateful for whatever force is moving through me and onto the page. My subject in this book is identity and I share about three identities that have informed, blocked and guided my life. Included in that story was the value of a weekend I spent with my friend, the late John Denver, as we simultaneously dealt with the sense of loss and pain in unwanted divorces. In recent years I hadn’t thought much about John and our relationship and thought I was somewhat “complete” in my grieving process – after all, his death was in 1997 and that seems a long time ago. Then in 2011 I joined 8,000 others to celebrate John’s induction as the first honoree of the Colorado Music Hall of Fame. The concert was great plus it felt good to re-connect with his former wife Annie and other Aspen friends. The surprise was my experience of emotional release; of sadness from missing my friend; of anger that he died so young and left me; and of joy that he lived and contributed so much to me and so many others. The experience was one of being ambushed by my own feelings – at first it was an irritation which transitioned into feeling overwhelming gratitude for having my heart opened. I'm Proud to be a Contributing Author! 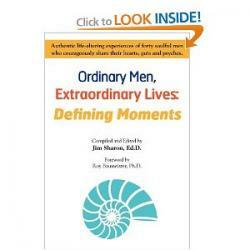 These are real stories from real men willing to share openly and honestly about their triumphs and tragedies. Ultimately, it represents a victory for men's spirit and commitment.